Sneakers are everyday footwear and kids especially love them because of their easy to use slip-on style, unlike boots and other types of shoes, like water shoes. 2017 has come and an explosion of possibilities in trendy footwear choice is now up for grabs. There are all types of engineered high-performance sleek threads, but none so special as the sneaker, which is a classic wear-anywhere and gives the user a unique experience either out and about or chilling on the sofa, they suit all purposes with ease everyday use. Choosing the right designer pair isn’t always a straightforward as some may think and if you are like me you want cutting-edge, dainty and comfortable, however knowing what kind you’re looking for exactly is difficult, especially when there is criteria like wanting the latest and greatest with awesome design and cool stylish features. 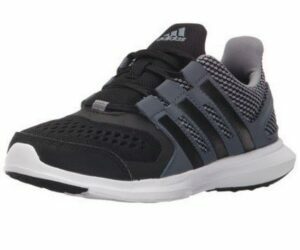 Support – Get a sneaker that supports your foot and if you have a flat foot for example, then make sure to get some extra support to ensure comfort when walking. Shape – Getting a shoe that is too narrow in the middle can be very uncomfortable and makes for poor running and less stability overall. Style – We all wanna look good and no-one more than your children, kids love to look good and by making sure the design stands out with make their step lighter. Flexibility – The shoe should be able to flex forward at the toe and the more that this can the better, but the rest at the back (roughly 2/3) should stay firm. Durability – Make sure the shoe can be twisted and rotated a little from side to side with a firm grip. Sole Strength – A good sole is essential and helps with the length of time they last, especially with active kids. Check with a finger either side and press together, less flex the better. Check Your Size – Make sure to get a measurement and see if your feet match the shoe type and brand cause they differ from sneaker to sneaker. Check Stitching – The better the stitching the longer the shoe will last, so by looking at the baseline and rim can help. Test The Sneaker – Give a go and walk around in them, jump about and get a general feel of what they might feel like on your feet. The worst thing is to get a pair home and they ain’t feeling comfortable. The Squeak – The dreaded squeak is never nice and finding a pair after purchasing is never cool, especially if your flooring is laminate for example and makes noise that drives everyone crazy. Style Factor – Adidas is a famous brand and well know with kids and collectors alike. The 3-stripe black panel feature over the grey synthetic looks great and stylish, which is why Adidas do so well in sales and popularity. Material – The flexible water-resistant synthetic is laced to keep water out, but is not water-proof. The rubber sole is light, comfy and thick enough to make for ease whilst running. Durability – The durable nature of this shoe is because Adidas make them to last, however, these are not meant for soccer or skateboarding for example. Comfort Rating – These are breathable, shock-absorbent and slip-resistant with a great tread. Sporty Type or Not – Ideal for running an indoor or outdoor sports like tennis or badminton. Not heavy-duty wear and tear (soccer or Football). Wide or Thin – Adidas usually make a thinner type of sneaker than say Nike, but this particular pair is somewhere in the middle in general. Washable – These can be washed and the feedback is positive, but again they might show signs or wear and can’t start to show signs of aging quicker than others not going through the washing machine. 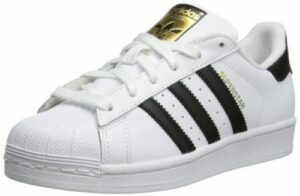 Style Factor – This leather-style classic is a well-known fashionable sneaker with 3-Stripes and has the shell-toe. The herringbone-pattern is well known and is a rubber out-sole with his “Superstar Sneaker”. Material – The leather is a nice bit of patchwork and the rubber sole is solid and ensures the foot. This has an EVA mid-sole and is a sleek stitch piece of craftsmanship. Durability – These are made to last and are durable to the point they can last years, but kids wearing is less-likely to be so, because we all know they get worn to the ground. Comfort Rating – Super comfy, great for comfort and great for general wear and tear. Sporty Type or Not – This is well padded, lined with a cushion to make running around and playing fun, but not an ideal running show if sports is primary, the previous show is better in comparison. Wide or Thin – This is a thinner type of shoe, but they do stretch later and take around a month to settle into the shape of the foot. Washable – White is always getting dirty and if you’re getting this pair of sneakers be prepared to give them a wash. They can be washed but it’s not advisable for general reasons, but can lessen the overall strength and stitching can be weakened. Style Factor – This is a classic 3-stripe sneaker and Samba as a line of a shoe has been going for years with loads of versatility and style. Material – This samba is not waterproof but is more water-resistant than the “Adidas Hyperfast 2.0 K” for example, however, the leather material and suede overlays don’t protect fully against the elements. The rubber and gum like a bottom are synthetic and the sole grips. Durability – This is an easy-to-maintain sneaker and being black does have its advantages. This can last through street wear and tear, but I’d rate it a 6 out of 10 for durability. Comfort Rating – This is a versatile shoe and the comfort is good with snug-like padding for long days out and about, so ideal for kids at the park and outdoors playing. Sporty Type or Not – These are great for indoor sports and are silent for moving around, squeak-less and agile. 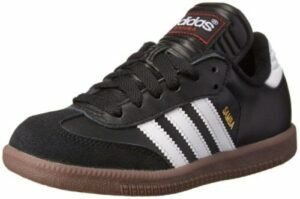 Wide or Thin – Adidas is always thin as a general rule compared to Nike for example and with own brand types the samba is tighter than the “Adidas Superstar Sneaker”, so bigfoots are warned. Washable – These black sneakers are washable and come out looking great, especially if they extremely dirty, but the suede does fade a little, plus stitching can look a little fragile and loose if repeated, but a one-off is usually fine. Style Factor – This is a low style profile sneaker which has a decorative everyday use and style, it’s signature wavy overlay is the main feature and red stands out all day long. Material – The lightweight shock-absorbent structure of this sneaker is ideal for light feet and the rubber sole, suede/nylon and sock liner with mesh is a treat to the feet. 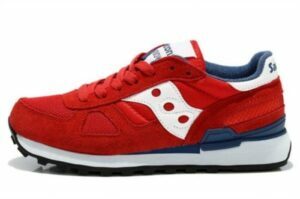 Durability – Suede, as a rule, is less likely to last than other synthetic materials because of its structure, but with the nylon, Saucony has made a solidly constructed sneaker. Comfort Rating – The padded mesh and sock liner makes this a wear-anywhere type of shoe and can be comfortable all day long. Sporty Type or Not – This is ideal for indoor types of sports and netball or badminton would suit well this Jazz-Sneaker. Wide or Thin – Saucony sneakers are tight at first but after a couple of weeks they fit and settle into foot shape. Washable – With his sneaker, the machine washable rating is less so, mainly because of its amount of suede which fades quick and can become un-knotted quickly in my experience. Style Factor – These Puma rocker-style sneakers are awesome and the signature strip aligns with pants to the point it ROCKS! Material – The pull-on water-resistant leather is OK with splashes but is definitely not waterproof, however, the rubber sole is large enough to pass a minor puddle. Comes with s sock-liner is removable and is a Kinder-fit type, which is well-known for cushioning in the shoemaking industry. Durability – The durable nature of the design makes this classic suede shoe a contender in this comparison, it’s high on the scale for durability. Comfort Rating – Extremely comfortable. Sporty Type or Not – Non-sporty but is adjustable and can be used for skating, but not made for this reason. Washable – This isn’t odor-resistant, but like most in this comparison, they do survive a wash, but suede should be less in the wash than other synthetic materials. 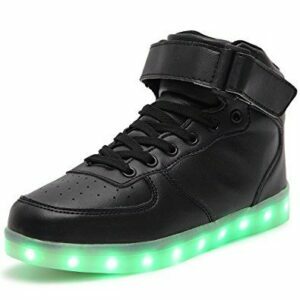 Style Factor – Kids love these state-of-the-art trendy fashionable high-heeled flashing sneaker. The black with the flashing and glowing light makes this a great pair to consider in this comparison. Material – These are not waterproof, but a synthetic material that can be ideal for parties and nights out as they flash brightly for all to see. They come with a lamp, rechargeable batteries and waterproof function at the sole. Durability – These are for special events and a sneaker to show-off with rather than long-term practical wear, but they will last months if kept in the right way. The recharge helps keep these shoes going and used longer than some other types of lighting-sneakers. Comfort Rating – They get a 5 out of 10 for comfort and compared to the previous 5 come last in the review for comfort, but with the flashing lights most kids don’t care. Sporty Type or Not – None sporty, but can be used for general wear, even dancing, but not vigorous sports and jumping. Wide or Thin – These are averagely-wide and not as thin as the Adidas Samba for example. 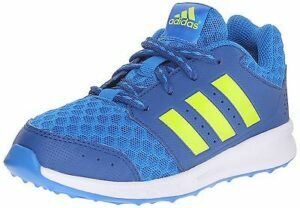 Style Factor – These are engineered high-performance sneakers to stand out at the training field or indoors at the mall, super-cool and super stylish with the Adidas yellow 3-stripe and light blue textile fabric. Material – The textured, flexible and reliable synthetic is embedded into the textile mesh. The rubber sole is large at the heel and less so at the toe to increase running capacity. The breathable mesh is synthetic and easy in ventilating heat produced from wear. Durability – These are very durable and they are normally associated with running and sports that involve that can of use. Kids training for activities and sports might enjoy wearing these as they do last the test of time. Comfort Rating – Extremely supportive with padded mid-soles and breathable mesh for increasing long hours of use. These are designed for sport and are much preferable than the “puma” sneaker for long hours of use. Sporty Type or Not – These are cutting-edge technology in sportswear and make them great for indoor sports and outdoors, however, the mesh makes them not at all ideal in rain. Wide or Thin – Mid-way in space and there is a little movement for the average shape foot, but not as wide as some in this review. Washable – Can be washed and these are less odor-absorbing than others, due to the purely synthetic material. The “Adidas Hyperfast 2.0 K Performance” is a great show and Adidas have done it again with making a signature sneaker that out-performs all others in this review. The “Saucony Jazz Hook and Loop Sneaker” is the best budget pick and kids wanting to have an all-rounder can be sure to get that with this sneaker.